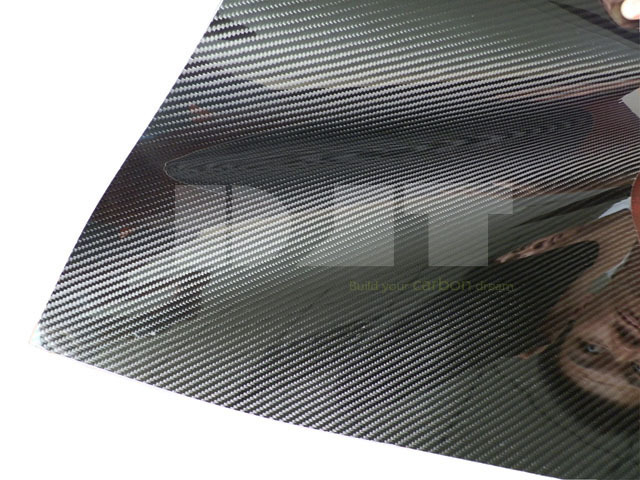 DJT Carbon fiber veneer sheets are available in different sizes, thicknesses and grades. DJT Carbon fiber veneer sheets are available in different sizes, thicknesses and grades. Our thinnest carbon fiber laminate can be used as a veneer, our carbon fiber veneers are flexible sheets in beautiful, deep, crystal clear finish with no pinholes or voids. DJT Carbon fiber veneer sheet has mirror-like finish, so you can see yourself very clear when you take a look at our carbon fiber sheet. And an epoxy surface coat makes it a 3D appearance. For the finish, there are glossy and matte finish for your choice; for the carbon weave, there are twill weave and plain weave. For such flexible carbon fiber sheets with good finish, it can be used in wrapping some parts when being backed with 3M sticky backing, it is a nice choice for car interior parts or other parts you want to be covered by carbon fiber. Car interior parts, Carbon fiber decoration use and so on.